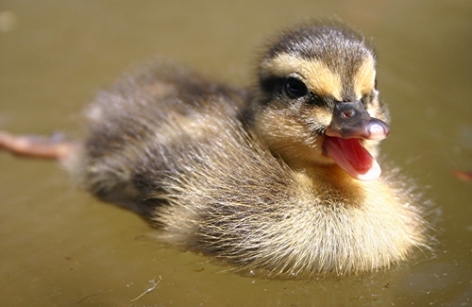 This baby Mallard (Anas platyrhynchos) is among the most commonly found duck species in all of North America, and can be found almost anywhere in the world. This cute quack is happiest in the wetlands, because much vegetation, worms, insects, and snails live there, and these are some of her favorite things to eat. Generally tolerant of people, every so often this young Mallard takes advantage of human food sources, and gleans grain from their crops to supplement her diet.